Notre Dame de Paris is probably the most famous Gothic cathedral in the world and a striking example from the early Gothic period. All content and photography unless specifically noted is the property of EuroTravelogue™. Unauthorized use is prohibited. Welcome to the October edition of the ArtOdyssey—my ongoing series that combines my love of art with my travels along the way. This month, my topic is "Architecture" and I am thrilled to bring to you the celebrated Gothic architecture of France. Ever since I can remember, I have been awestruck by soaring vaults, flying buttresses, towering spires, and of course magnificent stained-glass windows of heavenly light. But until my first visit to France, my only exposure to Gothic architecture had been St. Patrick's Cathedral in NYC, which by the way is Gothic revival since it was constructed in the middle of the 19th century, however it remains one of the finest examples nonetheless. But I yearned for more—I wanted to experience firsthand authentic Gothic that truly dates back to Medieval times, circa 11th-14th centuries. So to France I went to seek out some of the finest examples of Gothic architecture from its emergence to its culmination in the late Gothic period just before the age of the Renaissance. Along our journey, we'll discover Gothic cathedrals and highlight significant elements of each of them that have come to define the Gothic we know today. The Royal Portal of Chartres Cathedral in France. Above the doors and Main Gallery windows, you can see Abbot Suger's Rose window introduced at Saint-Denis in Paris. Because of the relatively low concentration of Romanesque cathedrals in the 11th century, France was fertile ground for Gothic to establish roots and flourish. It was here where the pioneers of medieval design pushed cathedral construction to soaring new heights and introduced new architectural elements with an emphasis on the vertical and light—some of the defining characteristics of Gothic architecture that soon would spread throughout Europe for the next 300 years. The term cathedral derives from the Latin cathedra or bishop, so in the simplest sense, a cathedral is actually a building that's home to a bishop. To quote one of my Great Courses books that embodies perfectly the concept of the cathedral: the cathedral is a building "rising to the heavens, a three-dimensional manifestation of art, science and religious fervor." Because of the needs of growing populations, places to house holy relics to serve as pilgrimage sites, crumbling decrepit churches, and the desire for Kings and Bishops to build unrivaled cathedrals, the Gothic cathedral emerged and it eventually would come to symbolize the city's power, economic prosperity and most of all, its sanctity! Significant engineering achievements that contributed to the Gothic period include the development of soaring pointed arches and ribbed vaults to allow cathedrals to reach unprecedented heights with relatively narrow walls as compared to earlier Romanesque designs; towering bell towers and spires that would soar to the heavens; and triforiums and clerestories (2nd and 3rd-story windows) that would bathe interiors with immense light. By combining the elements of the pointed arches and ribbed vaults with flying buttresses on the exteriors, architects could achieve vertical grandiose designs. This was accomplished by shifting the burden of the roof's weight from the walls to the arches and eventually to the columns below. Here you can see an example of the clerestory windows at the Amiens Cathedral in France. 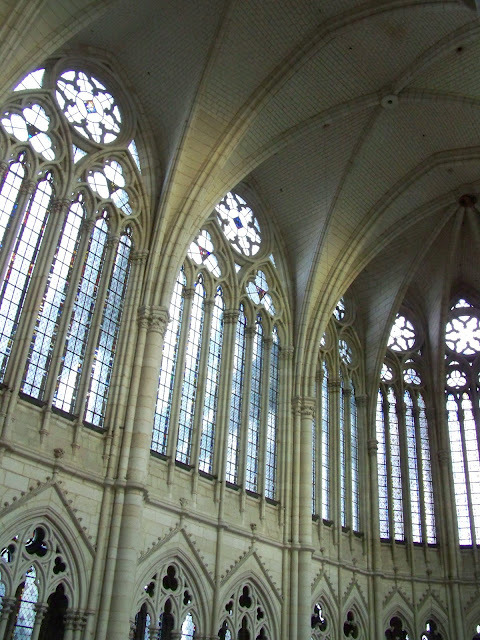 Note the vaulted and ribbed pointed arches of the ceiling and how the weight is distributed to supporting columns thus allowing for thinner exterior walls. This photo only: WikiMedia.org. Some of the most striking aesthetic contributions include soaring cavernous interiors bathed in light from the expansive windows; Rose windows above the portals; lancet or pointed-arch windows filled with magnificently ornate stained glass; and the theme of the Last Judgment appearing on the western facades—the main entrance of most cathedrals—over the portal and sometimes the Rose window above. The very first Gothic cathedral in the world—Saint-Denis in Paris. 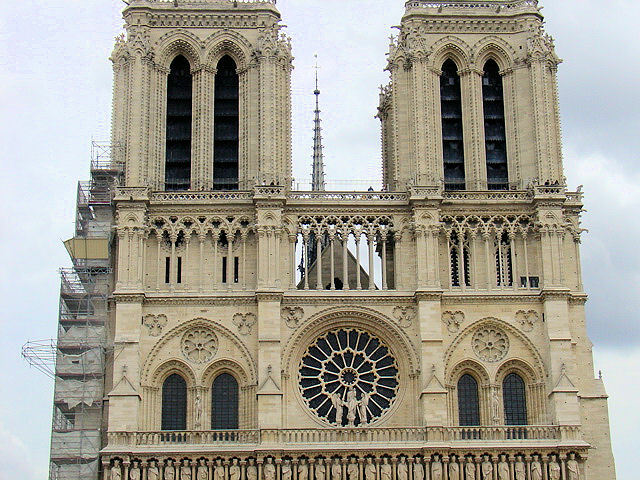 In this image, you can see the flying buttress and clerestory architectural elements introduced by the Gothic movement. 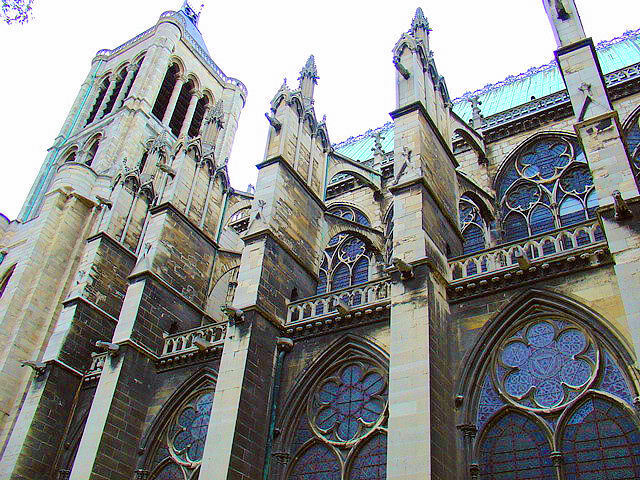 Undoubtedly, the very first Gothic Cathedral is Saint-Denis in Paris in the 18th arrondissement. Saint-Denis Basilica, whose construction began in the 12th century and wasn't completed for nearly 100 years, owes much of its design to the Abbot known as "Suger." For it was Abbot Suger's vision that was brought to life in many of the elements we see today in Gothic architecture. 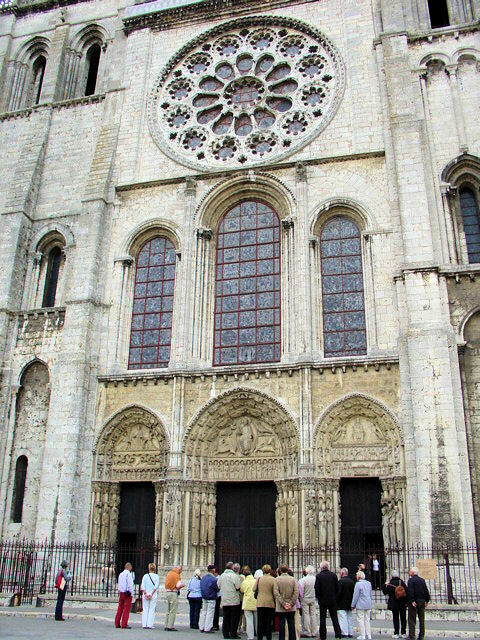 The Rose window centered above the western portal, sometimes laterals as well, is the result of Suger's design and believed to be symbolic of the "rose of heaven" itself. Also, the double ambulatory or the aisle and chapels that encircle the altar from behind are significant here because of the expansive interior of soaring vaults and extra large windows to allow in more light—symbolic of Jesus' teachings "I am the light of the world." It was important to Suger that his new design improved upon the much darker Romanesque predecessors. Decorating the Royal Portal or main entrance are sculptures depicting the Last Judgment because Suger believed that is here that you enter into paradise and Christians believe that we begin that journey from the Last Judgment. As you will see, these designs are incorporated in most of the Gothic cathedrals that followed. 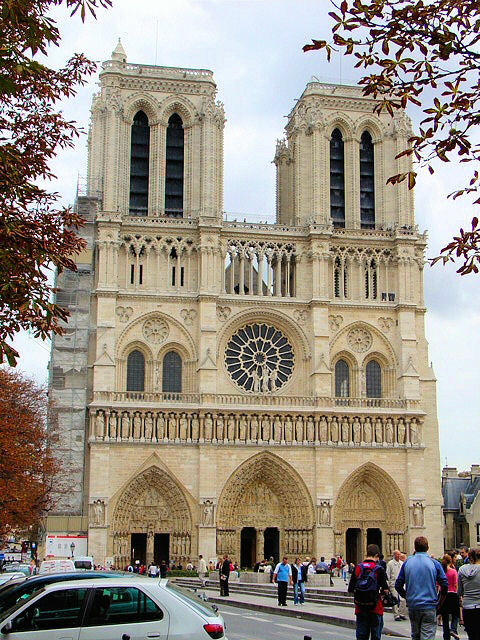 Notre Dame de Paris, the most famous Gothic cathedral in world, exemplifies all that is Gothic. Notre Dame de Paris is probably the most famous Gothic cathedral in the world and another striking example from the early period. Unlike other Gothic cathedrals whose construction integrates various designs, Notre Dame enjoyed unprecedented unity in its form due to the fluidity of its main construction period. One of the most obvious examples of this is its symmetrical western façade. Look carefully at other Gothic cathedrals and you'll find asymmetrical designs resulting from lack of funding, architect deaths, wars—among other reasons. Inside we see Abbot Suger's double ambulatory but Notre Dame's is extraordinarily wide. When you visit, be sure to climb to the top of the one of the bell towers for jaw-dropping views of Paris! Notre Dame de Chartres in stunning example of Gothic Architecture. 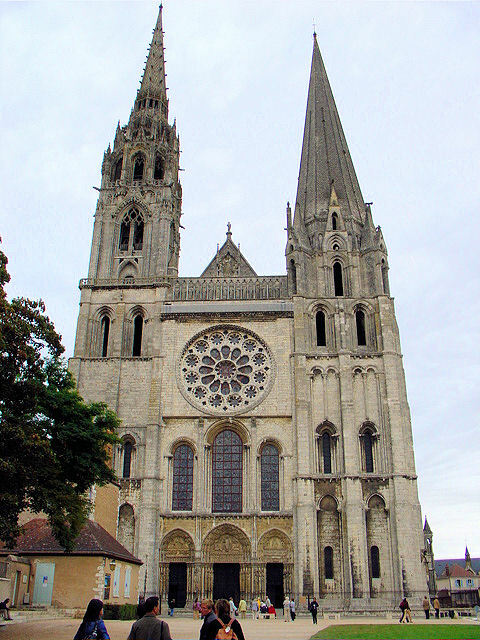 Renowned for its distinctive bell towers and radiant stained-glass windows, Notre Dame de Chartres or Our Lady of Chartres is one of Europe’s most revered cathedrals because of its state of preservation since consecration in 1260. Approximately an hour south of Paris and a fabulous half-day tour, Chartres remains today one of the finest examples of Gothic architecture in all the world. Strikingly evident from first approach, you can't help but notice its distinct bell towers—the result of the cathedral’s plagued history of destruction and rebuilding. Construction on the left tower began in 1134 but it was not crowned with its spire until the 16th century. The opposing southern tower was begun in 1145 but its Romanesque design remains as testament to an earlier time. Once inside, you'll find the interiors bathed in light from the cathedral's ORIGINAL stained-glass windows dating back to the 12th and 13th centuries. These tapestries of light recount stories from both the Old and New Testaments and once again we see Suger's influence in the three Rose windows constructed over the portals: western Rose depicts the “Last Judgment,” the southern Rose recounts the second coming of the Lord; and the northern Rose glorifies the Virgin. Seek out one of the most interesting features of Chartres Cathedral, its labyrinth. Laid in 1205, this 964-foot-long pathway retraces symbolically the steps from humanity to God and has long attracted pilgrims throughout history who come to retrace the path to eternal glory. Sculptures of the Last Judgment decorate the Royal Portal or western main entrance of the Chartres Cathedral. 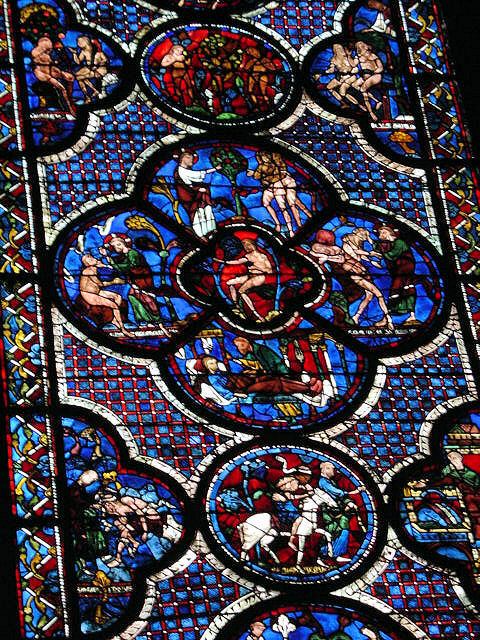 Chartres Cathedral is world renowned for its original stained-glass windows dating back to the 12th and 13th centuries. One of the finest examples of the Late Gothic is Sainte Chapelle located on the Île de la Cité near Notre Dame in Paris. Perhaps one of the most striking chapels in all of Paris is Sainte Chapelle located on Île de la Cité near Notre Dame. Ascend to the upper chapel and behold the translucent majesty of the soaring stained-glass lancets full of heavenly light! Completed and consecrated in 1248, most of these windows are original despite the Revolution wreaking havoc on the entire cathedral. Restoration efforts from 1840-1868 restored Sainte Chapelle to its former glory and today, it remains one of the finest examples from the Late Gothic period. Soaring lancet or pointed-arch windows of Sainte Chapelle bathe the interiors in heavenly light. We have barely scratched the surface of the entire Gothic movement but at least you have a foundation to build upon and a journey through its development in France. I urge you to seek out as many of them as you can and experience firsthand, the legacy left behind by these pioneers who pushed onward and upward to redefine cathedral construction and bring about the emergence of Gothic Architecture. Miami Art Deco Architecture by Lesley of CultureTripper.com. Appreciating Less with Mies van der Rohe by Kelly of Travellious.com. Monticello—America's First Great Mansion by Christina of DayDreamTourist.com. Modernist Architecture at MIT? by Erin of ASenseOfPlace.com. The Architecture of Oscar Niemeyer by Jenna of ThisIsMyHappiness.com. Until next month, I hope you find inspiring art in your travels! Very beautiful post. I visited Saint Chapelle when I was in France and I prefer it to its rival of Notredam de Pari, which was dark and empty. Hi there Ele and thank you so much for stopping by and for your kind words! You know, I loved Sainte Chapelle as well...I'll never forget the first time I emerged into the chapel...my jaw hit the floor! Stunning! Thx again! Know what, I nearly missed the cream of the crop-the staircase to the second floor where THE stained glass is. It's not marked with an arrow or any other sign, so I got up just by pure curiosity. Curiosity killed the cat, but it helped me a ton! Beautiful! This really is a very impressive cathedral, which is why many tourists go here. Hi there Marlys and thank you so much for stopping by. Which cathedral did you find most impressive? I bet you've been to all of them multiple times too...yes, I am envious! Thx again my friend. YESSSSSSSSSSSSSSSSSSSS!!!!!!!!!!!! My FAVORITE style of architecture. I almost talked about Gothic this month, too. Can I just live inside Sainte-Chappelle? It's just SO GORGEOUSLY PERFECT. I like that the restoration of Notre Dame de Paris reveals the change from a 4 level elevation to a three level. One day, I finally go to France (yes, i realize the irony of a medieval-phile never going to France). You know, I thought you may like this article! I always chuckle when you write about your Gothic geekiness! LOL. Thx so much for stopping by and sharing your comments and knowledge as well! Ooh, you've chosen a topic dear to my heart, Jeff. I'm always amazed to see what human beings were able to conceive of - and achieve, given the technology of the time. I believe they were (and may be still) making Chartres glass and shipping that incredible blue around the world; I've seen it several places, including a college chapel built in the 1960s in Winnipeg, Canada. Thanks for the in-depth look! Hi there Lesley and thank you so much for stopping by to share your love of Gothic architecture! Agreed about the level of achievement that was possible so long ago. And the Chartres blue is quite striking as well! Thx again. I'm going to chime in with the others and say that I too love, love, love Gothic architecture. Great comprehensive post of the style. I must get back to France soon. I will melt at the sight of these amazing spaces. Hi there Jenna and thanks so much for stopping by to share your love of Gothic architecture! I too, LOVE, LOVE, LOVE it!! I still need to see more! Hi Jeff - I loved this post of yours very much. I too absolutely adore architecture, and am absolutely fascinated by gargoyles and details on many of the historic buildings in Europe. Not that I have seen a lot of them personally, which I hope to some day. My recent visit to London, Rome & Venice had my eyes popping with the stunning architecture. I am not educated enough about architectural styles to make any comments, except to say I find it beautiful! Thanks for sharing your knowledge and the beautiful pictures. Hi there Deborah and thank you so much for your kind words. I too, am fascinated by all architecture, but I love Gothic especially followed closely by Renaissance. I bet you saw a lot of that in Italy! Thanks for stopping by and for your compliements! Hi Cole and thanks so much for stopping by and for your kind words! I love these and all the cathedrals we visited in Europe! Always a priority for me regardless of the itinerary. Wonderful article. I have to agree with you on Sainte Chapelle- magnfique! To listen to one of the many concerts performed in its chapel is to be as close to heaven as possible! Hi Patricia and thank you so much for stopping by and for your compliements as well. I love the way your describe your experirence in the chapel ... "as close to heaven as possible." I certainly believe it! I haven't had the pleasure to listen to a concert in Sainte Chapelle but I will seek one out on my next journey. I was fortunate enough to listen to on in Notre Dame and glorious doesn't begin to describe this heavenly experience. Thx again for stopping by! I am totally awestruck by the early Gothic architecture of Europe and Notre Dame is stunning. Two years ago, I stayed in an apartment directly across the street from St. Severin in the Latin Quarter -- quite a wonderful view of a beautiful Gothic church. Really enjoyed your always interesting perspectives and learning more about Gothic architecture. Hi there Cathy and thanks so much for stopping by! I too am totally awestruck by these colossal buildings and the fact that they were completed almost 1,000 years ago. It's almost inconceivable! I will need to look up St. Severin, never been there before. Most of all, thank you for your kind words! Wonderful write up on Gothic architecture, Jeff. You included some great examples of this era. I love all the light in Gothic cathedrals as well as the ribbed vaults. I also love how every little detail has a story. Its great fun learning about it all! Hi there my dear friend and thank you for stopping by! Oh, this article could have been a book for all of the Gothic architecture I wanted to include here. It was so much fun to work on this and even more fun visiting all of the cathedrals too...so many more await my discovery! I absolutely loved this post...I have fond memories of visiting the magnificent Notre Dame but St. Patricks too is so iconic and right in my backyard. Such a good read! Hi there Charu and thank you so much for stopping by and sharing your thoughts! I hear you about St. Patrick's and have visited many times throughout my life in NJ. I have fond memories of visiting St. Patrick's on Christmas Eve with my family growing up...part of our annual tradition of visiting Rockefeller Center to see the tree and then to St. Patrick's! It's quite extraordinary! I love looking at your blog posts. Beautiful photographs and nicely written. I hope you don't mind that I share them on the Facebook page, but they are really terrific! I am truly honored my friend and please feel free to share my posts as often as you like. Thank you for stopping by and requesting my permission.